Just a week on from taking the Formula Renault 2.0 ALPS title, Barcelona driver Javier Tarancon (Tech 1 Racing) claimed his maiden Eurocup Formula Renault 2.0 win following an absorbing duel with Carlos Sainz Jr. (Koiranen Motorsport). Starting from 18th on the grid, Daniil Kvyat (Koiranen Motorsport) produced a storming drive to finish third, the Russian finding his way past Robin Frijns (Josef Kaufmann Racing) on the final lap to help his outfit to the team title. Sainz Jr produced a perfect lap in qualifying to secure his fourth pole of the year, the Spaniard sharing the front row with his compatriot Tarancon. Lining up immediately behind them were Norman Nato (R-Ace Grand Prix) and Yann Zimmer (Arta Engineering), while Kvyat and Paul-Loup Chatin (Tech 1 Racing) were both caught out when qualifying was cut short, leaving them both well down the grid. Making a solid start, Sainz Jr held on to his lead ahead of Nato, who jumped ahead of Tarancon, with Stoffel Vandoorne (KTR), Zimmer and newly crowned Eurocup Formula Renault 2.0 champion Frijns completing the top six. On lap two Tarancon went wide as he attempted to regain second from Nato, the resulting shunt forcing the Frenchman to retire. The fight for fourth between Zimmer and Frijns was no less intense as the duo swapped places. Up ahead, meanwhile, the leading trio of Sainz Jr, Tarancon and Vandoorne broke away from the field. Neither of the Spaniards were giving anything away, the Madrid driver doing everything he could to keep his Barcelona-born rival at bay. Behind them Frijns finally got the better of Zimmer to move fourth. Tarancon was not to be denied, however, manoeuvring himself on to Sainz Jr’s diffuser on the long pit straight and getting past his man. Behind them lay Vandoorne, Frijns and Zimmer, with Kvyat storming through the field from his starting position of 18th, Will Stevens (Fortec Motorsports) and then Zimmer among his notable victims. 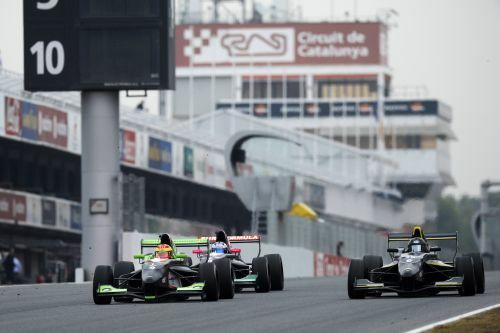 There was no stopping Tarancon up front, however, the Formula Renault 2.0 ALPS champion easing over the line for his first Eurocup Formula Renault 2.0 triumph, while Sainz Jr took second to secure the runners-up spot in the overall standing. Third looked to be Frijns’ when he passed Vandoorne with three laps remaining. Yet, there was to be a late twist in the tale as the surging Kvyat accounted for Vandoorne and then got the better of the Dutchman on the last lap, the final act of a truly memorable comeback by the Russian. Javier Tarancon: “It’s been a difficult season and I really needed this win, which I honestly feel is the best of my career so far. What makes it even better is that it came at home and that I really had to fight hard for it. And I’ve got a lot more to show yet. Wird die Meisterschaft in Most entschieden? Ready to climb the Raidillon!